Preparation: A cheese plate or cheese platter is not a very difficult thing to arrange. However one must try to keep it nice and simple. 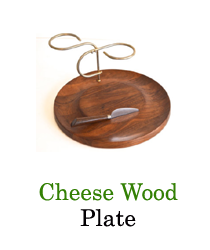 The following are a few tips which may be of some help while setting up a Cheese Plate. 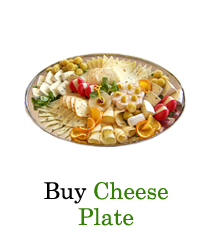 • Setting up a plate of cheese for a party may sound difficult, but it is one of the simplest preparations one has to do. • Deciding whether the plate will be simple or a little extravagant depends on the pocket of the host, the type of guest invited and the kind of party which is to be thrown. • Choosing for pocket-friendly and crowd-friendly cheese is a tricky task. • Keeping at least 4-6 different types of cheese, often does the trick. • Choosing cheese which have different textures and flavors is advisable. • Garnishes such as cured meat, nuts and fruits, usually do not go wrong. • Since cheese is a bit on the higher side of the expenses, it is a safe bet to serve it in the end, after all the food has been served. People would not have more than 1 ounce of each cheese. Creating a cheese plate: One thing, which never, goes wrong with cheese is wine. Serving wine with cheese is mandatory. So one has to find out how much cheese and wine is required, in accordance to the number of people invited for the party. Serving one ounce of cheese per person, of each flavor is a good idea. In case there is a cheese tasting or a cheese course dinner, then the quantity of cheese per person definitely increases. In such a situation, and average of 2-2 ½ ounces of cheese per person is usually served. The diverse number of cheese from different countries, make the Cheese Plate more appealing. However, overcrowding the plate is not suggested. Textures of the cheese, i.e. hard, semi hard or soft cheese needs to be balanced to suit the guest’s palates. Presentation: the presentation of the platter is extremely important; the plate must be simple and crisp, without overwhelming its look. The dish on which it is presented much be large enough so that the different types of cheese do not get mixed up and their aromas do not mingle. In case a platter gets mixed up, it completely destroys the entire tasting and all the efforts go in vain. Cutting small potions of each cheese carefully so that all the pieces look similar is important. 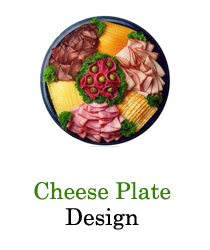 Different sizes of a single type of cheese make the platter look clumsy and repulsive. Another idea is to serve the cheese as a whole and let the guests cut out their pieces in accordance to their choices. The latter may have its own consequences, because there are possibilities that one type of cheese may over early and many guests may not have tasted it. Providing with cheese condiments is essential, crusty bread, fruit spreads, jam, nuts, olives etc are to name a few. Another idea is to write the name of the cheese along with the name of the country the cheese belongs to, so that the guest may not find themselves confused. The wine which is served must also belong to the same country as the cheese. Setting up the tasting: One thing which is always suggested in a cheese tasting party is to start the course with the mildest cheese and work up to the most flavorful one. The most complex cheese must be saved for the last. Another thing is that there may be people who are allergic to certain kind of dairy products. Many people who are lactose intolerant can be allergic either to cow milk or goat milk. So writing the source of the cheese can avoid any such problems. Providing separate knives for separate cheese is essential because it reduces the chances of the aroma and flavors of the diverse kinds of cheese to get muddled up.